If you are looking to win some huge cash prizes, free spins or holidays, then casino promotions are the way forward. Here we have gathered some of the best promotions currently available. Over the next few days, you have numerous opportunities to win some fantastic prizes so read on to learn about them and with a bit of luck, you will soon be celebrating a fantastic win. The first option is to deposit using the code ‘Trick’ and get a surprise 10% – 50% free play or a bonus of up to €300.. Alternatively, you can deposit using the code ‘Treat’ and get a guaranteed 25% free play bonus of up to €300. Best of all, you can use each code once a day up to a maximum of 26 times between now and the 1st November. That way you can claim a huge amount in bonuses and free play. You can use the free play money on a number of the casino’s top games including European Roulette, Multihand Blackjack, and the slots Rise of the Pharaohs, Mystic Mask, Transylvania Mania, The Unholy, A Nightmare on Elm Street, Spin or Treat, Millionaire Genie, and Jack’s Pot. Best of all, some of these games are linked to huge progressive jackpots so your free play could lead to masses of winnings. 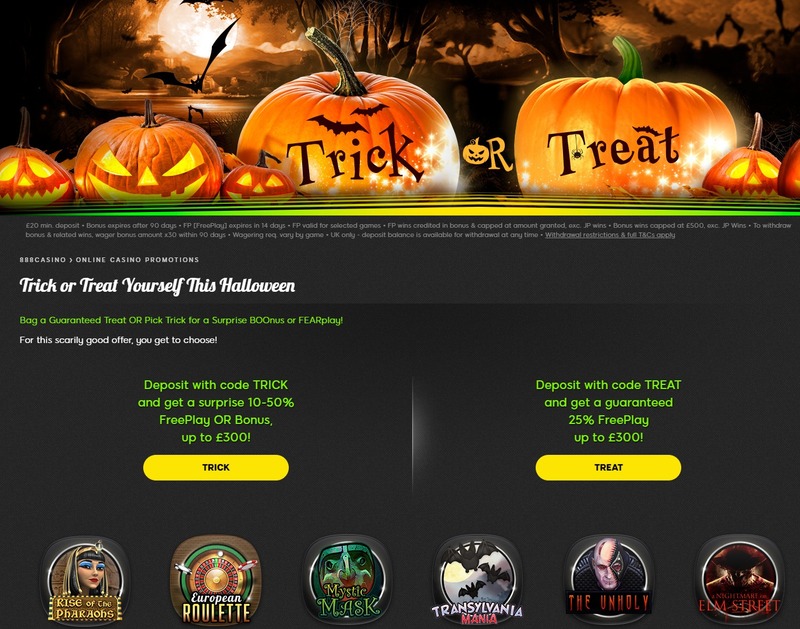 Make sure that you don’t miss out, head over to 888 Casino this month and claim your Trick or Treat. BGO Casino is giving you the chance to win a huge amount of money in a series of prize draws taking place. 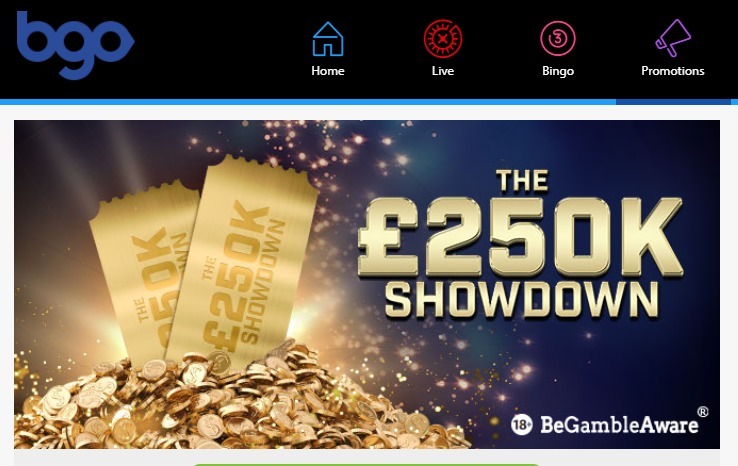 In total there will be £250,000 in cash and free spins given away. While the first two of the prize draws have already taken place, there is still plenty of time to enter the next one and win yourself a fantastic prize. All you have to do is opt into the promotion and then each week you can collect tickets for the prize draws as you play. Every £10 you bet on the eligible slots will earn you one ticket to the draw, and each week there is a Double Ticket Game that will award 2 tickets for every £10 bet. There is no limit to how many tickets you can earn, so the more you play the better your chances are of winning. This week there will be £100,000 given away and you have from Friday 12th October to Thursday 18th October to collect tickets. The eligible games are Age of the Gods, Age of the Gods: God of Storms, White King, Halloween Fortune, Eliminators, Terminator Genysis, Tiger Claw and Astro Babes. You can collect double tickets playing Terminator Genysis. The prizes are as follows: 1st – 2nd: £5000 cash, 3rd – 11th: £1000 cash, 12th –31st: £500 cash, 32nd – 91st: £100 cash, 92nd – 191st: £50 cash, 192nd – 691st: £20 cash, 692nd – 3191st: £10 cash, 3192nd – 8191st: 20 Free Spins on Age of Gods: King of Olympus. This is a great chance to win a huge cash prize while playing some fantastic slots. Make sure that you do not miss out. Head over to BGO and start collecting your prize draw tickets. BetVictor is giving you the chance to win cash prizes of up to £1,000 in its Feature Tournament over the coming days. All you have to do is opt in to the promotion, start playing the qualifying games, and the top 100 players with the most points will win prizes on the 15th October. There is a great selection of qualifying games for this competition including Iron Girl, House of Doom, Leprechaun Goes to Hell and Dragon Ship. You will collect points every time that you trigger a feature in the games. In Iron Girl you need to trigger the Iron Armour feature for 10 points. In House of Doom you need to trigger the Skulls of the Abyss bonus for 10 points. Ion Dragon Ship you need to trigger the Golden Treasure Chest Bonus for 10 points and in Leprechaun Goes to Hell you need to have 3+ Pots of Gold Free Spins Trigger for 10 points. The prizes will be distributed as follows: 1st – £1,000 cash, 2nd – £500 cash, 3rd – £350 cash, 4th to 5th – £250 cash, 6th to 10th – £100 cash, 11th to 30th – £50 slots bonus, 31st to 60th – £25 slots bonus, and 61st to 100th – £10 slots bonus. You have until the end of Sunday 14th October to collect as many points as possible so head over to BetVictor this weekend and set the reels spinning. Casino.com wants to encourage players to play the Age of the Gods jackpot games and to do so they are offering weekly cashback on selected titles. Every Wednesday you can get 20% cashback up to £20 on the selected games. All you need to do is opt in and then play either God of Storms, Medusa and Monsters, Fate Sisters or Ruler of the Sky. Thanks to this promotion you have a weekly chance to play for some huge progressive jackpots without having to risk too much of your own money. The slots are packed with great features and offer some huge fixed payouts so be sure to seize the opportunity. Next Wednesday visit Casino.com and see if you can become a God of Jackpots. Mr Green Casino is giving you the chance to win a stay in B340 on the Queen Mary ship, one of the top 10 most haunted places on earth. The ship is moored at Long Beach, California, and in addition to this top prize, there are 49 runner-up prizes worth a total of £10,000. The top prize includes: return flights for 2 from Europe to LA, private airport return transfers, 2 nights’ accommodation in B340 Suite, breakfast each morning, ghost tour of the ship for 2, 3 course dinner with wine for 2 on the ship’s fine dining restaurant, 60-minute haunted escape room for 2, Mr Green trick or treat candy in room on arrival, 5 nights’ additional accommodation at a 5* hotel in L.A. including breakfast each morning, private transfers from the Queen Mary to the hotel, £2,000 spending money and comprehensive travel insurance for 2. The runner up prizes are as follows: 1x £3000, 1x £2000, 1x £1000, 1x £500, 4x £200, 10x £100, and 30x £50. This is a great opportunity to enter a number of prize draws simultaneously and win some fantastic prizes. Make sure that you do not miss out. Visit Mr Green and start collecting your tickets today. Gala Casino is giving fans of table games a fantastic opportunity to win some huge cash prizes over the next few days. All you have to do is opt in to the competition and play any card and table games that you wish until the end of Sunday 14th October. Every £10 you bet will earn you 1 point on the corresponding leaderboard and at the end of the competition the top 100 players from the leaderboard will win a share of £2,000 cash. There is a top prize of £500, second prize of £250, third prize of £125, fourth prize of £75 and fifth prize of £50. Those who finish six to tenth win £30 each, eleventh to thirtieth win £20 each, thirty-first to fiftieth win £10 each, and fifty-first to one-hundredth win £5 each. If you enjoy card and table games and you are looking for a way to win a bit of extra cash then this is the perfect opportunity. Whether you want to play blackjack, roulette, baccarat or anything else, this promotion is the way to go. Head over to Gala Casino and start playing today.